Sweet. 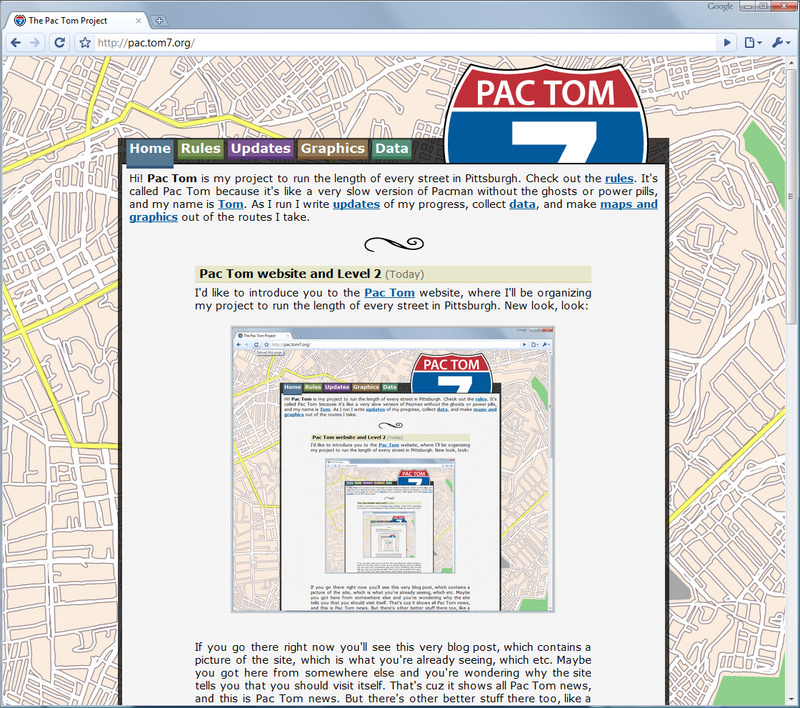 I like all of the graphics, like the road sign and the infinitely scrolling map background. You should add a progress bar to the home page showing the percentage you have left and a counter for the total number of miles run. Including a Google Map widget of all your routes would be cool also. A: I do not understand your numeric utterance. J: Thanks for noticing the infinite background. It took me almost a whole day to make it; rather a hard problem for Illustrator to tackle, it turns out. I like the idea of having a progress meter, but I since I don't have the Pittsburgh road data in any form that I can load up, I can't actually compute how much I've got left. I could do a progress meter of neighborhoods, I guess. You're right that the site needs some straightforward way for people to follow my progress. Total number of miles run I have at hand pretty easily and it's probably the next feature to go up there. Google Maps unfortunately can't handle (or rejects on policy grounds, I can't tell) my map data, which is almost ten megabytes. Google Earth works just fine though, so other than its embedability, you can just click the pactom.kmz to zoom like crazy. Tom: two things. Thing the one, you never do anything halfway, do you? Thing the other, will you change the first post to keep it up to date with what is actually on the home page? If so, is the process automated already? If not, how do you sleep at night? 2: I haven't yet tried to sleep since posting it, so I'm not sure, yet. One aspect of this project really appeals to me, and that is that you get to see every part of the city. 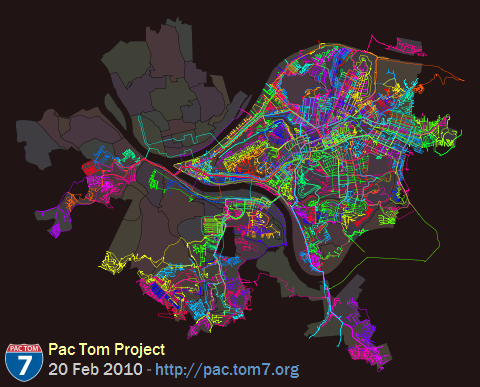 I'm tempted to try something similar but wimpy, such as biking every street in (comparably-sized) Washington, D.C.
Is there any open-source Linux type software that I could use to track progress, together with a GPS? My source codez are all open but a little bit Pittsburgh and Me specific, and they're all in SML. In any case you'd need a way to get KML files from the GPS. I think that most GPS interfaces are standard, or that there's some small set of standards. There must be linux software out there, but I don't know about it. The Forerunner 305cx is probably not an example because it uses wireless ANT+ to sync.